It has been a stay in your PJ's type of day. Cassie is still fighting something off and Doug and I were up last night with Jaxon and CJ trying to help them clean out their goopy eyes enough that they could actually open them. CJ was also running a fever for most of the night, though thankfully it hasn't had one today. I think Jaxon and Jayde's ears are on the mend and hopefully this eye gunk will follow and nobody else will get it. I sent the oldest three to school today but kept the boys home from preschool so we spent most of the day just lounging around and watching movies. 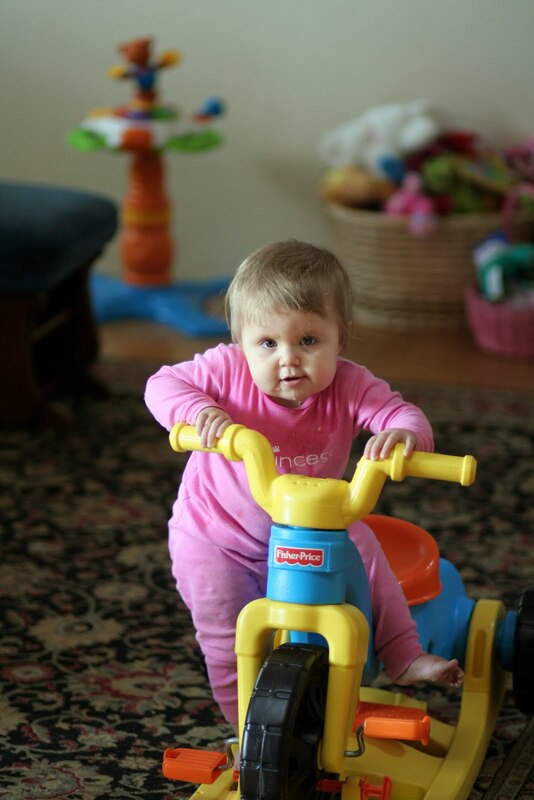 Cassie really enjoys playing on her new "motorcycle" that Grandma and Grandpa got her for her birthday. She will get on it (with some help) and rock it back and forth and she's also gotten pretty good at getting off all by herself. My baby is turning into a toddler!